The scenery at Botanica Wichita changes with the seasons, as do the gardens’ events. Beautiful reds, oranges and yellows blow through the treetops, signaling autumn is upon us. It is the perfect season for the biggest family-friendly event in Wichita, BOOtanica. 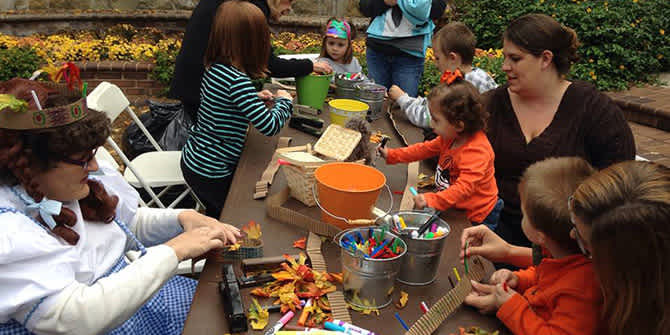 Step into the gardens as they are transformed into an educational Halloween-themed wonderland, equipped with interactive activities for all ages. Now in its eighth year, it is no surprise BOOtanica has gotten bigger and better over time. One of the first years, attendance was around 1,500. Now, more than 4,500 people attend annually. BOOtanica might be centered on kids 4-8 years old, but there is something fun for everyone. New this year, the Four-Point Ranch will be bringing their full petting zoo including a miniature horse, miniature cow, a llama, a donkey and so much more. Come with your costume or dress up for the photo booth, and take home a souvenir. Also, for the first time, Botanica Wichita is teaming up with Wichita State’s Ulrich Museum to offer creative education along the pathways between gardens. Children will get the chance to be creative and take home their work of art. Visitors can touch live bugs with the Bug Lady, who will have all her creepy crawlers out on display. Also, the Great Plains Nature Center is bringing their owls for children to learn all about the birds of prey. As families walk through the gardens, they will find a decorated plant graveyard and a mad scientist, experimenting with different chemicals. He will be one you’ll want to stop and watch, with a performance that lasts about 10 minutes. What would fall be without pumpkins? Pick yours for $3 and decorate it at the decorating center, then get your face painted to match. Also, make sure you allow for time to feed your competitive side with the oversized lawn games, or be the first to finish the Haunted Scavenger Hunt. BOOtanica offers fun for all ages, with the chance for everyone to create their own works of art, have their fortune read, and dance until they drop with DJ Ronnie Choy. Crowds will also enjoy watching a live performance on the terrace featuring The Studio Performers, a local children’s music program. Head out to Botanica Wichita as the leaves change for this popular event. Admission is only $9 for non-members and $6 for members. Children under the age of 2 are free. To check out other fall family-friendly events click here, or for the brave ones, here are some spookier options. Adults and bigger kids can find Halloween fun by visiting some haunted houses or some of the most haunted places in Wichita.